Sure, you can sell back or donate your old phone when you upgrade—but you can also keep that old smartphone and put it to other inventive uses around your home. Here are a few of them. Most of the newer Android devices from Samsung, LG, and HTC come with a built-in infrared blaster, which works with your TV, DVR, cable box, or DVD/Blu-ray player. 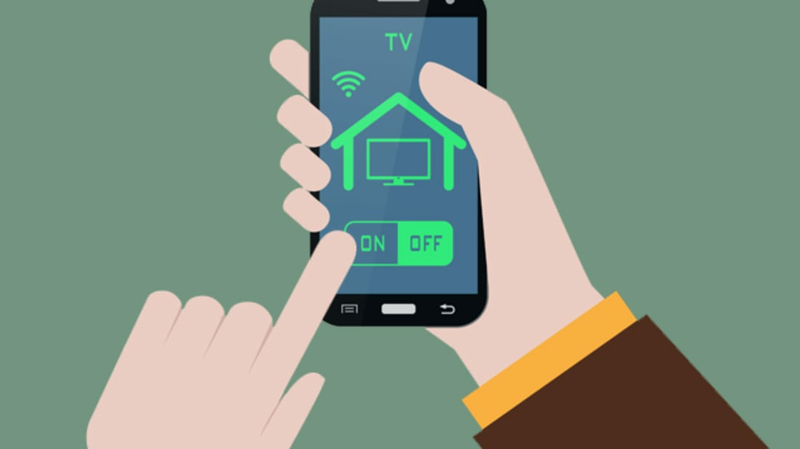 You just need to download an app like IR Universal Remote from the Google Play Store to turn your device into a remote control. If you have an Apple TV, you can use your old iPhone as an alternate remote for your set-top box. If you have an older device or one that doesn’t have a built-in IR blaster, there’s still hope. Some companies make external IR blasters that allow you to connect your phone via bluetooth, which then gets transmitted to the TV via a special device. If your old smartphone has an 8-megapixel camera or higher on its rear, then you have a decent enough sensor to turn it into a dedicated point-and-shoot digital camera—one that can upload photos directly to your social media accounts when you get to a Wi-Fi network. You can even buy lenses from olloclip.com or photojojo to make your old iPhone’s photos crisper, wider, and more dynamic. Video baby monitors can get pretty pricey; put that cash toward diapers and use your old smartphone instead. All you need to do is download an app like Cloud Baby Monitor or Baby Monitor 3G (which both retail for $3.99), place your old phone so that it looks into the crib, connect it to your home Wi-Fi network, and use another device or computer to watch your child from afar. The same thing goes for a security system in your home. If you want to keep an eye on your house (or monitor what your cat or dog are up to) while you’re at work, download an app like Presence and buy a robotic viewing stand that can rotate a full 360 degrees. After placing the phone in the stand and connecting it to your home Wi-Fi network, you can use the app to turn the phone in any direction to ensure that all is well. A kitchen can be a hazardous place for an expensive smartphone or tablet. Keep your current device clean by using an old phone to store recipes and search for cooking videos on YouTube. There are a number of recipe apps, including HotPot and BigOven, that can help with a big family dinner, while apps like How to Cook Everything guide you through the process of making fresh pasta. With note-taking apps like Evernote and Google Keep, you can sync shopping lists across all of your smart devices. You can also use Siri or Google Now to set timers. As long as your device has GPS capabilities, it can be used as a navigational device—even if you don't have a data connection. Most of the smartphones made within the last five years have GPS built-in, so all you need are the proper apps to get the most out of your old iPhone or Android device on your next road trip. TomTom USA, CoPilot GPS, and NavFree USA all offer offline regional maps and turn-by-turn directions; you just need to download the area map on your home Wi-Fi network before you hop into your car. A map of the entire United States could take about 2 GB of space, so make sure your old device has plenty of room or a microSD card slot for additional storage. While these apps range in price from $10 to $40, Google Maps offers the same offline capabilities for free. Set up your old iPhone or Android device as a dedicated webcam for Skype or other VoIP (Voice over Internet Protocol) services, such as Vonage and Google Hangouts. Just make sure you have steady Wi-Fi and a desktop dock or stand to make video and voice calls to your family and friends. If you have an iPhone 4 or iPad 2 or higher, you can still use your old iOS device for FaceTime with your loved ones over a good Wi-Fi connection. Why let a perfectly good screen go to waste? If your old smartphone’s screen is still in good shape, turn it into a dedicated e-reader. Just download apps like Amazon Kindle, Barnes & Noble Nook, or Google Play Books to read books on your device. You can even download apps like Pocket or Instapaper to read articles you saved from your favorite websites to read later. It might not be the most exciting way to repurpose your old smartphone, but turning it into a nightstand clock might get you out of bed on time. There are a number of clock apps, like Nite Time and Night Clock, that are simple and reliable, while apps like WakeVoice and Alarm Clock HD can give you weather updates and the latest news when you awake. Your kids already can't get enough of your smartphone, so when it’s time to upgrade to something newer and shinier, give your old one to them. You’ll give them endless ways to play games and watch videos, but be sure you take some time to back up your data and wipe the phone back to factory settings before you hand it over. For iOS users, connect to your home Wi-Fi network and then go to “Settings,” then “iCloud,” and then “Backup.” Turn on “iCloud Backup,” select your device, then start the backup process. Once that’s complete, connect your iOS device to your computer and launch iTunes. In the “Summary” panel, click “Restore” and confirm factory reset. For Android users, connect to your home Wi-Fi network, and then go to “Settings,” then “Backup & Reset.” Make sure “Backup My Data” is set to “On.” Once it’s done backing up all of your photos, passwords, and contacts to your Google account, go to “Factory Data Reset” to restore your phone to its original factory settings. After you reset your device—but before you hand it over to your kid—set the phone with parental control or restricted access, so your child don't spend hundreds of dollars on in-app purchases or access inappropriate content or websites. Make sure you set up a password or PIN for every download on your device, so that he or she has to ask for your permission every time they want to download something or make an in-app purchase. After you restrict access, download kid-friendly games, apps, and YouTube Kids, which can only access videos suitable for children. You can donate your old device’s idle computing power to advance scientific research from around the world. The projects include everything from exploring new medical therapies to the discovery of planets and stars. Research scientists at UC Berkeley’s Space Sciences Laboratory developed an Android app called BOINC (Berkeley Open Infrastructure for Network Computing), which allows the researchers to tap unused processing power from smartphones and put it toward analyzing data or running simulations that would otherwise be too expensive and costly. BOINC users are volunteering their mobile phones' resources and power to essentially build a large supercomputer for scientific research.